In February, the Global Fund Board processed a small batch of funding approvals –– one multi-country grant, one matching fund award and one set of interventions on the Unfunded Quality Demand Register –– with a total value of $16 million. President Donald Trump’s proposed budget for fiscal year 2020, released last week, undermines the aspiration he expressed in his February State of the Union address to obtain bi-partisan support to eliminate HIV in the U.S. and the rest of the world. Though advocates and commentators believe it unlikely that Congress will approve the proposed cuts, they still signal a retreat of U.S. leadership on global health. Issues related to the availability and quality of data figured prominently in two audits recently conducted by the Office of the Inspector General on grants to Rwanda and Benin. Because Rwanda’s grants follow a results-based model, the availability of good and reliable data is especially critical. At the Global Fund’s Pre-Replenishment meeting in New Delhi, in February 2019, the India Health Fund launched the nationwide ‘Quest for Innovations towards Eliminating Tuberculosis', in partnership with the Global Fund, Tata Trusts, and India’s national TB program, among others. The fund, launched in 2016, was designed to stimulate and motivate domestic innovative financing in order to fund innovations in TB and malaria programming. Its work to create a “pipeline of innovations” currently focuses on ten projects, involving diagnostics, adherence, increasing case notifications, and open source drug development, among others. 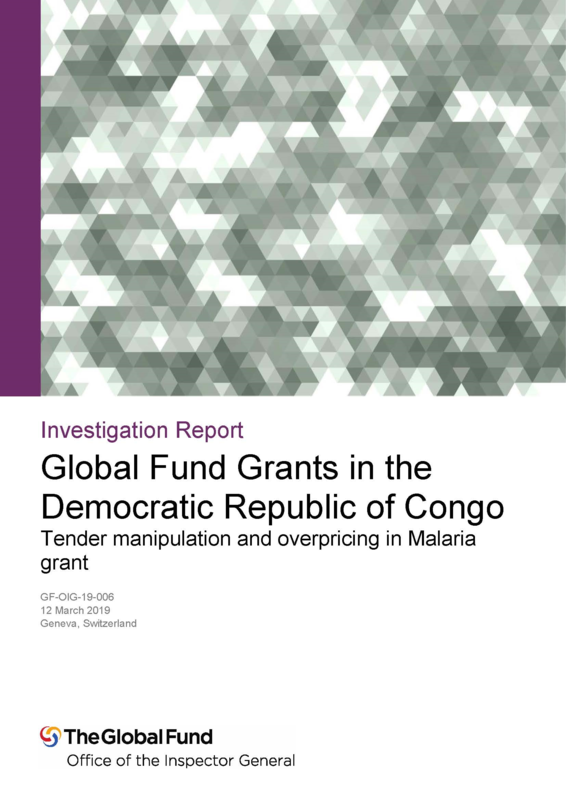 The Office of the Inspector General has found that between 2015 and 2017, the Global Fund’s malaria grant in the DRC was subject to “systemic manipulation of procurement and supply-chain related expenses” through collusion and deliberate schemes to overprice, designed by senior managers appointed by Population Services International, the Principal Recipient. The cumulative losses of more $7,386,066 have since been repaid to the Global Fund in full. The Global Fund country coordinating mechanisms have been called “cornerstones of the Global Fund architecture” in-country. With by their broad representation and mandate, CCMs can help improve the performance of the grants. In a joint commentary from Aidspan’s CEO and its senior policy specialist, Aidspan puts forward suggestions to improve CCMs’ functioning and effectiveness. Malawi has made significant progress in the fight against HIV, tuberculosis (TB) and malaria since it started receiving Global Fund funding in 2003. Malawi faces significant challenges in implementing Global Fund grants, such as low domestic contributions to the health sector, low absorption of Global Fund grants, and a weak health system, which undermine achieving maximum impact against the three diseases. Some challenges relate to Global Fund processes while most relate to Malawi’s economic and political context. Solutions include increased country investments in health systems, addressing bottlenecks to effective absorption of funding, and increased oversight of grant implementation. Short summaries of varied news and items of potential interest to those who are part of, or linked to, the Global Fund, its partners and communities. As part of the Global Fund Advocates Network (GFAN) campaign for the Sixth Replenishment for the Global Fund, GFAN is developing short videos thanking donors for their contribution to the Global Fund and implementing countries for their commitments to health. GFAN is looking for additional contributions, by March 31. Senior managers appointed by the Population Services International (PSI), the Principal Recipient (PR) for the Global Fund’s malaria grant in the Democratic Republic of Congo, were responsible for tender manipulation leading to “systemic and significant overpricing” of contracts for transportation, warehousing and customs clearance, resulting in an estimated loss to the Global Fund of $7,386,066. The OIG investigation was triggered by ‘red flags’ raised by PSI in May 2017, after the PR carried out its own internal audit in March-April 2017. The OIG initiated an investigation based on PSI’s initial findings. The OIG’s investigation report, made public on 12 March 2019, identifies three types of wrongdoing: collusion, abusive practices, and non-compliance with the grant agreement. The report acknowledges both PSI’s and the Global Fund’s respective roles in the wrongdoing: PSI’s poor oversight of its DRC operations and inadequate measures at headquarters level to identify issues at country level, and the Global Fund’s lack of evaluation of PSI’s own internal controls, which contributed to the Fund’s inability to detect any irregularities in grant implementation. The proposed recoverable amount is the full $7,368,066, which PSI has already paid back. PSI is no longer a Global Fund PR in the DRC. The investigation included two field missions by the OIG, to DRC from 11 to 23 December 2017, and to Washington, DC (where PSI is based) from 11 to 15 June 2018. The scope of the OIG’s investigation was limited to the procurement and supply-chain management components of the PSI grant, which came to a total of $38.15 million (out of $178 million of expenditures across all line items for the implementation period January 2015 to December 2017). Of the $38.5 million spent on procurement and supply-chain related line items, 32% was reviewed by the OIG. 1. A PSI senior manager in DRC approved special tender conditions and deviations from PSI’s headquarters’ procurement policies, without PSI headquarters’ approval in advance. This meant that bidders with lower prices were consistently eliminated from tender evaluation processes, with contracts awarded to higher-priced bidders. Further deviations included overpricing in land transportation contracts, customs clearance charges, warehousing expenses, air and river transportation, and communications. 2. A restricted tendering process to hire transportation vendors facilitated the creation of an anti-competitive, bid-rotation scheme that resulted in significant overpricing. This came about as a result of PSI in DRC hiring four fiduciary agents to manage payments related to LLIN mass campaigns in different provinces, two of which were authorized by PSI to carry out tenders for transportation contracts in their respective zones of the country. AMA 2: The Secretariat will address the supplier misconduct in accordance with the policy on supplier misconduct and the Sanctions Panel Procedures. (Due 30 September 2019; owner: Head, Grant Management). 3. Ineffective governance and oversight by PSI headquarters enabled the misuse of fiduciary agents: PSI headquarters did review fiduciary agents’ contracts and verify invoices before payment through headquarters, but “did not identify the limiting nature of their contractual arrangements,” the OIG said. PSI did not require the agents to follow PSI’s own administrative policies and procedures. 4. PSI’s decentralized business model resulted in a lack of visibility of, and control over, program implementation in DRC. Because PSI headquarters lacked a “proper understanding of the DRC context,” the OIG said, it was unable to challenge its DRC senior managers’ decision or proactively address potential issues relating to procurement and supply chain. 5. The assurance framework agreement between the Global Fund and PSI was insufficient, and reduced both parties’ ability to identify risks proactively. The Global Fund relied on internal controls designed by PSI without evaluating their effectiveness, the OIG report says, (the framework did not require such evaluation, either by the Local Fund Agent [LFA] or PSI’s external auditors) and because of this, the Fund had inadequate assurance on key portfolio risks. Practically, this meant that the LFA did not review tenders that were initiated in DRC but were paid by PSI headquarters, thereby reducing the Fund’s visibility into tenders carried out by PSI in DRC. It also meant that the Fund did not verify the PSI-hired fiduciary agents’ terms of reference or performance; furthermore, the Fund considered the fact of PSI having hired fiduciary agents a risk-mitigating factor (page 21 of the report provides substantial further detail). Customs clearance charges on containers of Long Lasting Insecticidal Nets overpriced by 20% (a loss of $586,651). Both Population Services International and the Global Fund have already acted to redress – or prevent recurrence of – the issues the OIG has identified. PSI has refunded in full the amount of the combined overpricing and dismissed the individuals responsible for the wrongdoing in DRC. In addition, grant management for all Global Fund-supported programs are now consolidated in the Global Fund Management Unit (GFMU), among other measures. Though predating this investigation, in 2016, the Global Fund created a dedicated Supply Chain Department (unrelated to this investigation but in response to the generalized high risk associated with in-country supply chains). In 2018, the Fund also set in motion an Integrated Risk Module to strengthen the integrated risk and assurance framework further. The DRC is the second-largest country in Africa, the 12th-largest in the world, and has a population of 81 million people, 44% of whom live in urban areas and 90% of whom live on less than $3.10 per day. Only 50% of the country can be reached by road or rail transport. Though DRC once possessed a healthcare system “renowned in Africa,” the OIG report says, decades of ongoing conflict and the complex political and economic challenges resulting from the conflict have made the DRC one of the most difficult countries in the world in which to deliver health-care services. The DRC is a ‘high impact’ Global Fund country (very large portfolio, mission-critical disease burden) and is designated a ‘challenging operating environment’ with additional safeguard policy in the Global Fund’s differentiation categories for country investigations. The Global Fund has signed a total of $1.998 billion worth of grants with DRC, of which $1.63 billion has so far been disbursed. Currently (for the implementation period 2018 to 2020) the Global Fund is financing five active grants (see Table 1 above).